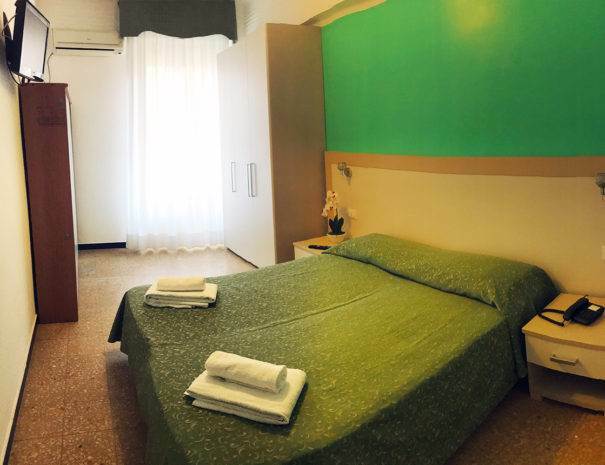 Hotel Mignon 2 stars in Alassio, not far away from the beaches of the beautiful Riviera of Ponente in Liguria, is the ideal location to spend an unforgettable holiday at the seaside. From the hotel, you can easily reach the beach on foot and enjoy the beauty of the coast from Capo Mele to Capo Santa Croce. You just need to cross the street and you will be able to choose among a lot of bathhouses along the coast of the Riviera, to visit the popular Budello or to see the historic Muretto (wall), destination of so many VIPs.The sixteen rooms of Hotel Mignon in Alassio have a minimalist and modern style and offer all the typical comforts of a 2 star hotel: daily cleaning, their own private bathroom, complimentary toiletries, hairdryer, air conditioning, safe, LCD TV, Wi-Fi and telephone.In an area as Liguria, which is rich in culinary tradition, food has a central position at Hotel Mignon, too: you will try international and traditional Ligurian dishes with always fresh and tasty ingredients. We pay special attention to children and guests with particular alimentary requirements: our menu also includes dishes for people with specific food needs.The dining room of the hotel is big, light and can contain 60 guests. It is particularly suitable for family celebrations and company events.